The 4* Elite Hotel is located in a quiet area of the old city of Prague. The Old Town Square and Wenceslas Square are just 5 minutes walk away. 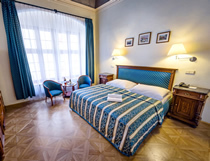 The Elite Hotel is a wonderful historic building with 78 rooms, all tastefully renovated and many of which contain original antique furniture. Rooms are fully furnished with a modern en-suite bathroom & WC, towels, safe, minibar, telephone, Satellite TV and free Wi-Fi. All rooms at the Elite Hotel have air conditioning. The hotel restaurant, Elite Garden, serves a range of International food; dine inside the restaurant or outside in the courtyard garden. The lobby bar is open all day through to midnight and serves a variety of drinks from coffee to wine and cocktails, plus homemade snacks and sandwiches. There are also restaurants, cafés and bars all around the hotel in the Old Town and New Town (see 'Nearby Places' for restaurant recommendations). The hotel has a wellness centre with a sauna, whirlpool and massage facilities (charges apply). Elite Hotel has its own garage parking. Price: 25 EUR per night.